A 49-year-old man presented to the emergency department with an eight-hour history of unsteady gait, impaired concentration, difficulty speaking and blurry vision, which had developed over the previous seven hours. During the preceding two days, he had been excessively thirsty and drank large amounts of water, cola and a “sports drink.” He had eaten a large portion of rice with dinner the evening before presentation. On the day he presented, he had awoken in the morning feeling dizzy. As he was leaving for work, he had experienced difficulty using his keys and turning doorknobs. The patient’s medical history included Crohn disease and two major small-bowel resections at 33 and 35 years of age that had left about one metre of small intestine. He had undergone an esophageal bougienage three weeks earlier for a stricture related to Crohn disease. After the bougienage, the patient had regained his ability to consume solids and dramatically increased his caloric intake to regain weight. His diet consisted mainly of fast food, candy bars and soft drinks. The patient reported that he did not smoke, consume substantial amounts of alcohol or have any drug allergies. On a daily basis, he took prednisone 20 mg, loperamide 2–4 mg, vitamin B12 and multivitamins. Except for the addition of prednisone for the Crohn-related stricture, his regimen of medications had not changed during the past year. He had experienced no changes in his usual Crohn symptoms. On clinical examination, the patient was alert, oriented and not in distress. His vital signs were normal and he had no significant postural changes. Other than mild vertical and horizontal nystagmus, the results of cranial nerve testing were normal. The patient had truncal ataxia and notable dysmetria on finger-nose testing. He had an unsteady, wide-based gait and could not tolerate walking more than five steps. Rapid alternating movements and heel-shin tests were normal. His strength and reflexes, and the results of sensory testing, were normal. The rest of the clinical examination was unremarkable except for midline abdominal surgical scars. Initial laboratory investigations are presented in Table 1 and include a serum carbon dioxide level of 10 mmol/L with an anion gap of 22 mEq/L. Complete blood count, creatinine, coagulation studies, liver enzymes and urinalysis were within normal limits. Arterial blood gas analysis showed a pH of 7.21, partial pressure of carbon dioxide (pCO2) of 23, partial pressure of oxygen (pO2) of 119 and HCO3− of 9. Serum lactates and osmolal gap were normal. Screens for serum salicylates, acetaminophen, alcohol and ketones were negative. A computed tomography scan and magnetic resonance imaging of the patient’s brain were also normal. The patient was admitted for further investigation and given 2 L of isotonic saline over eight hours for suspected mild hypo-volemia. The next morning, his anion gap was normal. The only neurologic symptom that persisted was a sensation of gait imbalance. On re-examination, all abnormal findings had disappeared except for the ataxia, which was markedly improved. Within 24 hours, the patient’s symptoms had resolved. A review of the literature on causes of anion-gap acidosis raised the possibility of D-lactatemia, particularly given the patient’s history of multiple small-bowel resections. His first blood sample from the emergency department was refrigerated and sent to a specialized research laboratory for a D-lactate assay. The patient was discharged with a provisional diagnosis of D-lactic acidosis. He was advised to consume a low-carbohydrate diet and was given a prescription for metronidazole to be started promptly in the event of recurrence of his neurologic symptoms. This poorly absorbed antibiotic is effective in reducing levels of D-lactate-producing bacteria. The result of the D-lactate assay came back several days later and was 8 mmol/L (normal < 1.0 mmol/L). Metabolic acidosis with an elevated anion gap has a limited differential diagnosis (Box 1). 1,4–6 The laboratory tests investigating these typical causes were negative in our patient. D-lactic acidosis is a much rarer cause of metabolic acidosis with an elevated anion gap. Its presence is suggested by elevation of the anion gap in patients with shortened small bowels when other causes have been excluded (Table 2). These theories are not supported by a study showing that infusion of D-lactate into healthy volunteers to a serum concentration of 6 mmol/L did not cause neurologic symptoms. 9 This finding suggests the presence of other mediators associated with D-lactate. 1,5,9 However, infusing D-lactate into peripheral venous blood may not reproduce the clinical presentation associated with D-lactic acidosis because D-lactate absorbed from the colon passes through the portal circulation and into the liver before being released into the systemic circulation. 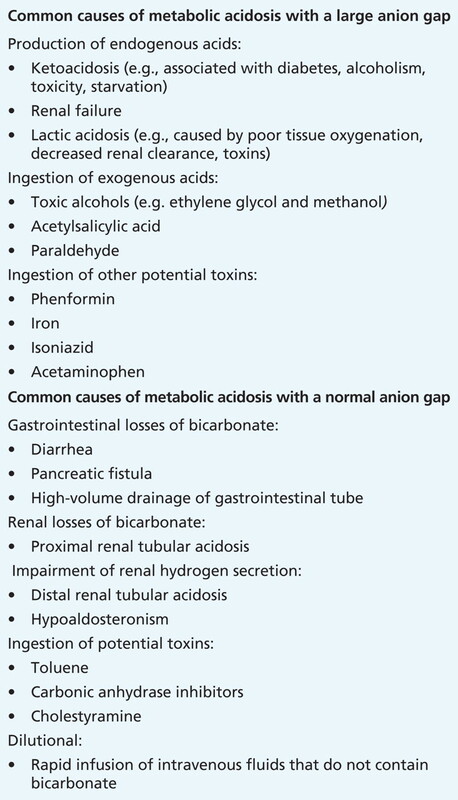 When common causes of mixed, normal or large anion gap metabolic acidosis have been ruled out, a comprehensive review of less common causes should be considered. D-lactic acidosis should be considered in patients at risk for short-bowel syndrome who have new-onset gait ataxia, cerebellar dysfunction and metabolic acidosis with a large anion gap. Treatment consists mainly of intravenous fluid resuscitation and poorly absorbed oral antibiotics. Prevention strategies include a low-carbohydrate diet, maintenance of hydration and avoidance of simple sugars. Acknowledgement: The authors thank Dr. Mitchel Halperin for his helpful insight. The section Cases presents brief case reports that convey clear, practical lessons. Preference is given to common presentations of important rare conditions, and important unusual presentations of common problems. Articles start with a case presentation (500 words maximum), and a discussion of the underlying condition follows (1000 words maximum). Generally, up to five references are permitted and visual elements (e.g., tables of the differential diagnosis, clinical features or diagnostic approach) are encouraged. Written consent from patients for publication of their story is a necessity and should accompany submissions. See information for authors at www.cmaj.ca. Uchida H, Yamamoto H, Kisaki Y, et al. D-lactic acidosis in short-bowel syndrome managed with antibiotics and probiotics. J Pediatr Surg 2004;39:634–6. Haschke-Becher E, Baumgartner M, Bachmann C. Assay of D-lactate in urine of infants and children with reference values taking into account data below detection limit. Clin Chim Acta 2000;298:99–109. Inoue Y, Shinka T, Ohse M, et al. Changes in urinary level and configuration ratio of D-lactic acid in patients with short bowel syndrome. J Chromatogr B Analyt Technol Biomed Life Sci 2007;855:109–14. Bakhru MR, Kumar A, Aneja A. A 58-year-old woman with mental status changes. Cleve Clin J Med 2007;74:457–62. Halperin ML, Kamel KS. D-lactic acidosis: turning sugar into acids in the gastrointestinal tract. Kidney Int 1996;49:1–8. Davids MR, Segal AS, Brunengraber H, et al. An unusual cause for ketoacidosis. QJM 2004;97:365–76. Zhang DL, Jiang ZW, Jiang J, et al. D-lactic acidosis secondary to short bowel syndrome. Postgrad Med J 2003;79:110–2. Fine A. Metabolism of D-lactate in the dog and in man. Perit Dial Int 1989;9:99–101. Oh MS, Uribarri J, Alveranga D, et al. Metabolic utilization and renal handling of D-lactate in men. Metabolism 1985;34:621–5. Uribarri J, Oh MS, Carroll HJ. D-lactic acidosis. A review of clinical presentation, biochemical features, and pathophysiologic mechanisms. Medicine (Baltimore) 1998;77:73–82. Abeysekara S, Naylor JM, Wassef AW, et al. D-lactic acid-induced neurotoxicity in a calf model. Am J Physiol Endocrinol Metab 2007;293:E558–65. Kaufmann P, Shungu DC, Sano MC, et al. Cerebral lactic acidosis correlates with neurological impairment in MELAS. 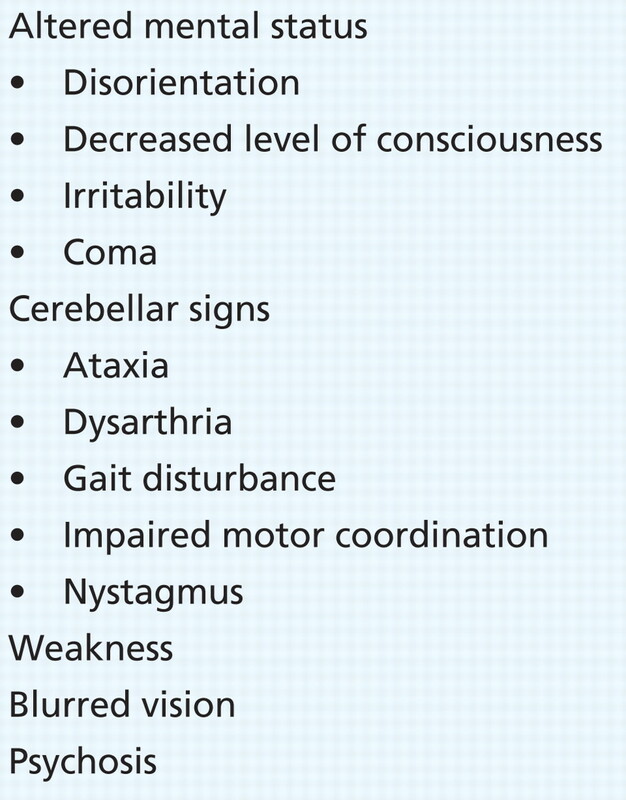 Neurology 2004;62:1297–302. Stacpoole PW. Lactic acidosis: the case against bicarbonate therapy. Ann Intern Med 1986;105:276–9. Kreisberg RA. Pathogenesis and management of lactic acidosis. Annu Rev Med 1984;35:181–93. Luft FC. Lactic acidosis update for critical care clinicians. J Am Soc Nephrol 2001;12(Suppl 17):S15–9.